Reduce, Reuse and Rethink is a CBC News series about recycling. We're looking at why our communities are at a turning point and exploring ways to recycle better. You can be part of the conversation by joining our Facebook group. Canadians are throwing too much garbage into their blue bins, sometimes out of laziness or ignorance, but sometimes with the best of intentions. And it's costing recycling programs millions of dollars a year. "It's shameful, it's awful. 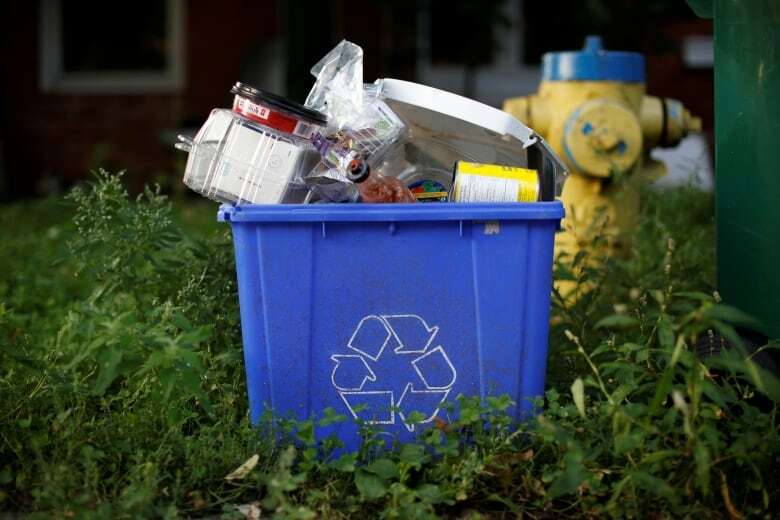 In some instances almost one in three pounds of what goes in a blue box shouldn't be there," says Mark Badger, executive vice-president of Canada Fibers, which runs 12 plants that sort about 60 per cent of the curbside recycling collected in Ontario. Contamination is the technical name for non-recyclable material or garbage in the recycling system, from leftover food in containers to non-recyclable plastic packaging to more obvious garbage such as clothing and propane tanks. Many cities are struggling to clean up their recycling and lower their contamination rates, but the potential solutions also have high costs and trade-offs. In the cities with the dirtiest recycling, Toronto and Edmonton, contamination rates can be upwards of 25 per cent. Badger has seen everything, including many items that are hazardous to plant employees. "Things like blood bags," he said. "Things like IV tubing. Things like needles and sharps. Things like dead animals. Things like bullets. Things like bear spray." It's expensive to process contamination as recycling, only to end up sending it to the dump as garbage. "You basically pay twice to manage garbage," says Jim McKay, general manager of solid waste management for the City of Toronto. As it moves through the system, contamination can damage other materials, especially in cities such as Toronto where everything goes in the same bin. That can turn tonnes of other perfectly good recyclables into garbage or at least lower their value and make them more difficult to sell to offset the cost of recycling programs. 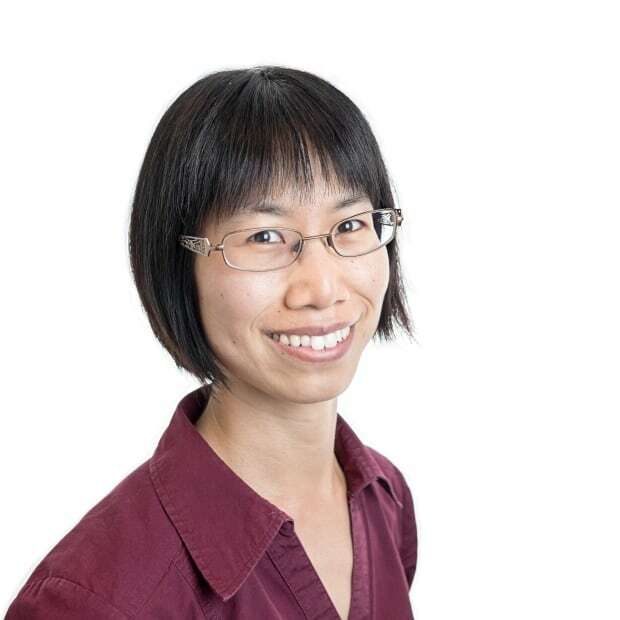 McKay estimates that each percentage point decrease in contamination could lower recycling costs in Toronto by $600,000 to $1 million a year, "and that correlates right back into the rates that we charge for waste collection." And under the city's contract with Canada Fibers, if the city's average contamination rate reaches 27 per cent, it will get hit with an extra $5 million charge. Contamination has recently become a much bigger issue because China, the world's biggest importer of recyclable material, started banning imports of paper with more than 0.5 per cent contamination — a standard that North American cities are struggling to meet. "Something as simple as a piece of paper with a coffee stain on it — that piece of paper a year ago would have been recyclable," says McKay. "Today that's actually garbage." Medical waste, such as blood bags and used syringes, or dead animals are also expensive problems because workers need to temporarily shut down the plant and sanitize everything when that comes through. But a lot of contamination is less obvious. At a transfer station in Toronto's west end, cardboard, plastic bags and other blue bin waste is temporarily piled into multi-storey mounds so it can be loaded into bigger trucks before heading to the local sorting plant. McKay uses a big garden rake to snag items out of the pile that he deems non-recyclable, including a bag that once contained dog treats and a black plastic coffee cup lid bearing the recycling symbol. "It looks like recycling, feels like recycling, it's actually marked as recycling," he says "It's not." At least, not in Toronto. The technology at the local Canada Fibers plant can't identify and sort black plastic. It's a growing problem as our food and other products are increasingly stuffed and wrapped in confusing new types of packaging. St. John's and Vancouver have contamination rates of just three and 4.6 per cent respectively. That keeps costs down and makes it easier to sell their recyclables for a higher price. St. John's is able to sell almost all its recyclables, including paper, within Canada, says Ian Froude, the municipal councillor who handles public works. Glass and styrofoam, which break into shards or pieces that contaminate paper and plastic when they get embedded. Plastic bags, which often contain food residue when put out for curbside recycling. Froude said St. John's decided not to accept those materials after consulting with other cities on the design of its recycling program seven years ago and hearing how hard it was to market contaminated material. "If it's not purchased by somebody, it's got to eventually go to the landfill, so you're wasting your time," he said. In Vancouver, glass goes in a separate bin, and plastic bags and styrofoam must be returned to a depot. 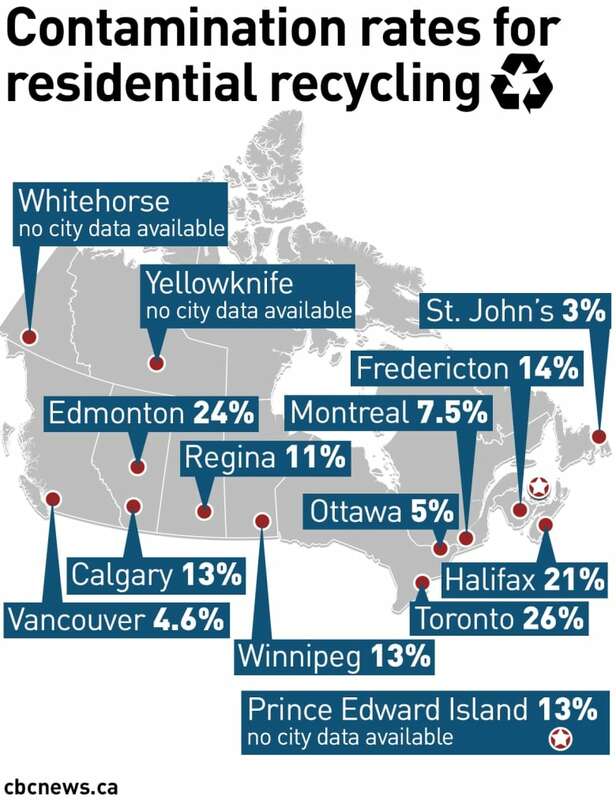 Both cities also require their residents to separate paper, cardboard and containers in their curbside recycling, unlike Edmonton and Toronto, where everything typically goes in one bin or bag. 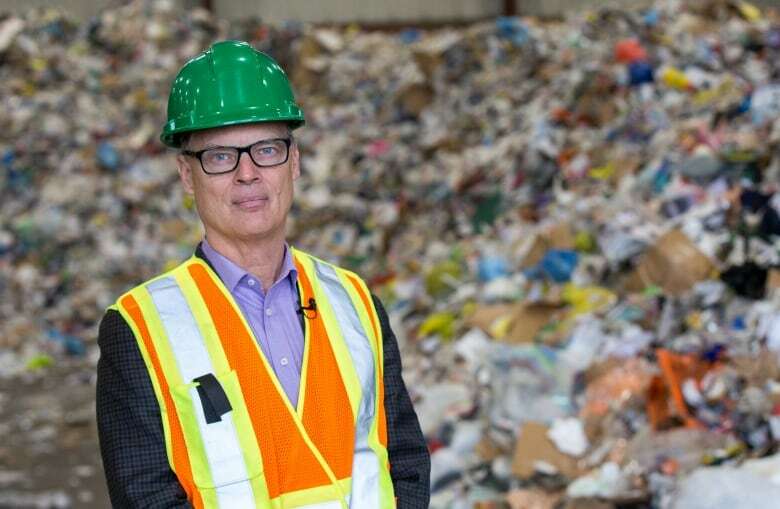 Allen Langdon, managing director of Recycle BC, which runs recycling programs province-wide, says "single-stream" programs that don't require residents to sort recyclables always have the highest contamination. With the new international standards brought in by China's crackdown on contamination, Langdon says, "One of the things this is going to force is [for] people to look at their programs again and determine whether they can meet the standard that markets are demanding while still using single-stream collection." Edmonton is reviewing its recycling program. 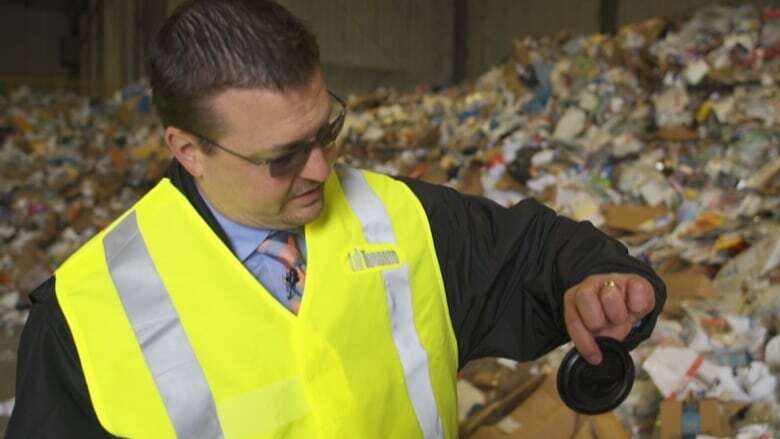 Michael Robertson, the materials recovery facility contract manager for the City of Edmonton, says when the city opted for a single-stream program two decades ago, its philosophy was to keep recycling as simple as possible. St. John's illustrates the trade-off — its contamination rate may be low, but only about 60 per cent of households participate, apartment dwellers have to make a request in order to participate at all, and about 35 per cent of households still put five bags of garbage out on the curb every week. 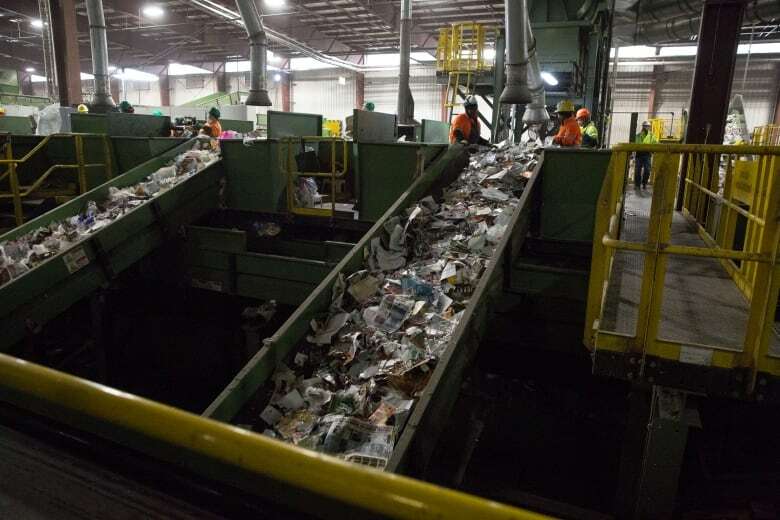 But Edmonton is considering several options, including requiring residents to sort their recyclables, changing the items it accepts and upgrading its plant with technology to better sort out contamination. In the meantime, both Toronto and Edmonton are taking other measures, including slowing the belts at their recycling sorting facilities to sort material more effectively and targeting residents with education campaigns. Toronto is hitting residents with audits and has considered fining violators. Use their city's online app (Waste Wizard in Toronto and WasteWise in Edmonton — there are equivalents in other cities) if they're not sure whether an item is recyclable. "If everybody took the initiative to make that effort and educate themselves in each individual instance where they were uncertain, it would definitely improve the quality of the product we're seeing here," Robertson says. In the meantime, he says, if you're not sure whether something is recyclable and don't have time to do the research, it's better to put it in your recycling bin and risk a little contamination. "We would rather have it come here so we can determine if it's recyclable," he says, "than erring the other way and losing the opportunity to recycle that material." 'Wasted': What happens when China no longer wants our trash?